*Editor’s note: This blog originally appeared on the Indiana INTERNnet blog and was authored by the organization’s new intern, Christi Raichle. Between taking 18 credit hours, having two in-person internships, and keeping a healthy social life, college has seemed like a whirlwind. However, to further my professional development and career goals, I wanted to have as many experiences as I possibly could. So, I logged into IndianaINTERN.net and found an amazing virtual internship that I’m still active with today! My virtual internship is with Indy Displays, an ecommerce display booth company, as the digital content strategist intern. In this role, I’m doing some graphic design work, as well as writing content for their blog to promote their company. This position is wonderful for me, because it allows me to earn extra money while growing my skills in a way that works well for my busy schedule. The best part of this internship is that I’m able to work on skills that I would otherwise be lacking. For example, I had planned on not doing a lot of graphic design work for school or any other internships. This internship allows me to do something that I genuinely love, while still getting paid and expanding my skills. The other great thing about this internship is that I work remotely. I love being able to work on my own time and from the comforts of my own home. Not only does this allow me to spend time with my family, but it also allows me to put myself in the most comfortable position to be creative. It doesn’t matter if it’s 2 a.m., or 2 p.m. I’m able to work on my own time, when creativity hits me the hardest. Of course, I still have deadlines to follow, but working on my own time helps me meet those deadlines. Having a virtual internship does come with its own challenges. There is a delicate balance when juggling so much work and school, and sometimes your virtual internship gets put on the bottom of your priority list. However, this is easy to avoid by having good communication skills and effective time management. When taking on a virtual internship it’s important to not only evaluate how much time you have available, but also ask the right questions to ensure you will have enough time for other priorities. For example, this position is sometimes project-based. I’m able to let my supervisor know when I’m ready for a project, and they will assign it to me. I’m also able to tell them when I’m a little too busy for a project. For example, I had a deadline at the beginning of the semester, but was unable to meet it due to being overwhelmed with the first week of classes and getting used to a new schedule. I emailed my supervisor and let her know that I would be a few days late and she completely understood. It is important to note that this won’t ALWAYS be the case with virtual internships. The key to having a successful virtual internship is choosing the right one. Make sure you know exactly what is going to be expected of you before you start the internship so you can set yourself up for the best success possible. Overall, your experiences with a virtual internship are all about what you choose to do with it. 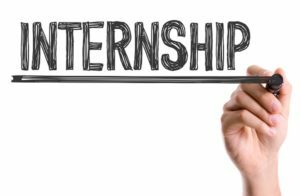 Just like traditional internships, what you get out of your internship depends on you! This entry was posted in Education and tagged college, creativity, indiana internnet, internship, virtual internship by Indiana Chamber of Commerce. Bookmark the permalink.